With the boundaries between professional and private life increasingly blurred by mobile technology, most people are simply finding it tougher to enjoy life either at home or at work. For those looking for a way out of the frustrating maze of daily life, bestselling author and respected communications coach Kate Burton offers the keys to achieving, in both one's professional and private life, a renewed sense of ownership, possibility, and meaning. In Live Life, Love Work, she poses such essential questions as "Whose Life Is It Anyway?" before offering readers an inspiring "Brave Action for Change." 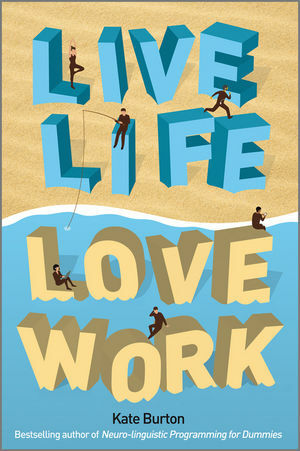 For those interested in enriching both their personal and work life, Live Life, Love Work offers practical, insightful tips on how. Kate Burton has co-authored three books in the 'For Dummies' series: Neuro-linguistic programming for Dummies (2004); Building Confidence for Dummies (2006); and Neuro-linguistic programming Workbook for Dummies (2008). She is a well respected international professional coach, and an active member of the International Coach Federation. She works with business leaders and executives looking to make changes in their business performance, stakeholder relationships, career transitions and personal well-being. Kate's particular strengths lie in enabling professionals to express themselves powerfully. Over the last twenty years, she has consulted on communication and change with organisations across industries and cultures - such as KPMG, GlaxoSmithKline, SwissRe and Waitrose, as well as leaders in Education, 'SME's and entrepreneurs. She delivers custom-built workshops and seminars for corporations that boost motivation, self-awareness, confident communication and health.? She leads two not-for profit activities that help people find confidence and purpose in their working lives. Coming from a background in marketing and PR, Kate is well placed to actively market and promote her books via her corporate workshops, talks, press activity, networks and online media. She plans to run specific workshops with business groups around the 'Live Life, Love Work' theme. For the past four years, she's written a monthly newsletter on self-confidence for the website set up to promote Building Self-Confidence for Dummies. Kate is the 'Motivation and Confidence' expert, contributing regularly to an on-line community at www.missionpossible.co.uk. She also writes a blog at www.turquoisemoments.blogspot.com which has postings about taking time out from work to enjoy the 'here and now'. She also has the support of dedicated expertise in social media within Microsoft and will develop a technology-based promotional campaign that capitalises on blogging, Facebook, Twitter, Linked-In and other appropriate social networks. 6 Brave Action for Change.